I started my web programming in 2001 and I have pretty much seen all the versions of Visual Studio over the past 12 years. Microsoft released yet another version of the IDE this October – Visual Studio 2013. As with any other release, Visual Studio 2013 brings in a lot of framework and language enhancements for different project types and development environments. But I am more excited with this release than any other for a single reason: there are lots of enhancements for ASP.NET as a platform. Web as a platform is moving very fast and Visual Studio as an IDE needs to catch up. I feel Visual Studio 2013 is now packed with all the things a web developer needs to build a modern web application conforming to all modern standards. No more confusion in creating web applications, there will be only one choice now. We call it Scaffolding on steroids as we can scaffold pretty much anything in ASP.NET. You can now say good bye to design view. BrowserLink makes it possible to do live update to your pages. Bootstrap template is the default template for all new ASP.NET projects in VS2013 now. You now have the spy lens at your disposal called CodeLens. This lets you know how many places a function/class is referenced right above your function/class definitions. I am super excited about Visual Studio 2013 for all the ASP.NET features & enhancements. My favorite being the One ASP.NET feature. If you are also excited as I am then go ahead, download this whitepaper and get to know the new things in Visual Studio 2013. You can grab a copy of the whitepaper here. 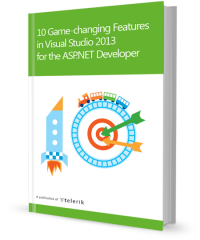 We hope you too enjoy the 10 features of Visual Studio 2013 that we mention. As always, we would love to hear your feedback. Is there a feature you like and we haven’t covered it, feel free to write a comment below.